I got to see Frozen on Broadway over the weekend and was treated, first and foremost, to a show that was very aware that its audience skewed older. Evidently, approximately 70% of the people going to Disney’s Broadway shows are adults without kids and Michael Grandage took this into consideration while directing the staging of Jennifer Lee’s updated script. It removes some of the more childish jokes from the film, trades the cute trolls for some downright frightening creatures of Icelandic folklore, and features some very dark mental states for its main characters. It’s still a family-friendly show and plays closely to its source material, but adults actually might feel a bit cultured going to see it instead of feeling like they’re placating their child by watching fish Heely across a stage. Frozen the film had a famously difficult history. Development goes back as far as 1937 when Walt Disney — after the success of Snow White — wanted to bring the much-beloved Danish tale to life as an animated feature. But while the tale was a classic, it wasn’t easy to render for the demographic of audience Disney films were starting to cultivate. It’s a morally ambiguous story with no concrete villain. Even when the film began real development in 2011, it was plagued by the same issues. Elsa, envisioned as the traditional picture of toxic maternity that is Disney’s female villains, was a woman stilted at the altar who froze her own heart and intended to do the same to Anna. It lacked emotional weight. So, new director Jennifer Lee tasked songwriting team Robert Lopez and Kristen Anderson-Lopez with taking time to think about what Elsa felt about herself and how a song from that perspective might go. They threw together a demo of a new song that was so well received it changed the script entirely, reconceptualizing Elsa as a co-protagonist of the film who had a complicated relationship with her own powers. That song that won her the chance to tell her side of the story did make into the final version of the film, if you can’t guess which one it was. So in 2014, Disney greenlit production on the Broadway show that had its own series of setbacks. By the time the show opened at the St. James Theater last month, it had run through two directors, two Elsas, two set designers, and three choreographers. While that seems like a bit of a revolving door of disaster, the heart of the show remained constant. The new songs would give voice to the nonverbal cues of the animated feature and grant the wishes of those who felt the film should have focused more on Elsa. Two solos were added for her, one an internal monologue during her coronation where she contemplates the possibility of reconnecting with her sister now that she’s queen (“Dangerous to Dream”) and one far more complex focused on her own self-loathing and cynical view of her gifts (“Monster”). “With great power comes great mental illness,” said the one-off Jessica Jones season two character the Whizzer. Elsa might not disagree. The show never lets the audience forget that even the most powerful parts of Elsa and Anna were born out of emotional trauma. 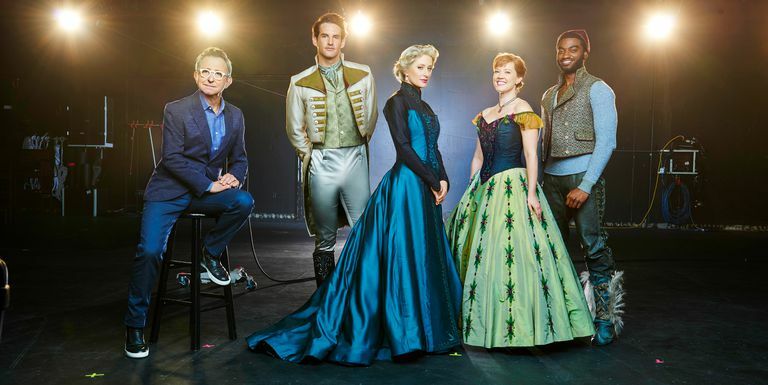 While there were only hints of how deep Elsa’s anxiety and depression ran in the film, the show’s book — and Caissie Levy for that matter — don’t hold back. “Monster” is the raw and unfiltered twin to “Let it Go” with a look into the darkest parts of Elsa’s mind. The song is full of self-flagellation as she journeys through her own brain trying to come to terms with the consequences of her actions and the best way to help. Ultimately, she drops to her knees in the bridge of the song and very plainly asks the memory of her parents if her death would make the world better off. Speaking on the bluntness of the moment, Anderson-Lopez said: “It has the weight of all the people who look to Elsa and identify with Elsa. People who are dealing with secret shame do tend to go to a dark suicidal place often, so can we show that in a truthful way.” It’s probably the most poignant moment of the show and it’s certainly earned. But Elsa does not dwell on the thought and powers forward into the climax of the story. ... And she’s doing that powering in a pantsuit. The Internet has been all over that since it was unveiled as Elsa’s Act II costume, replacing the iconic ice dress for the majority of the show. It cuts a powerful silhouette and offers Elsa some intelligent practicality. Also from my third row vantage point those pants looked comfy as heck. I’m sure there’s some cultural reading on it and a more than slight nod to Hillary Clinton and her role as a self-proclaimed “pantsuit aficionado,” but I’ll leave it at that the pantsuit works pretty well in practice, even if it sounds goofy on paper. Ultimately the show — for all its changes and additions — expands its center to invite the audience into a prismatic look at Anna and Elsa. Patti Murin is an ideal Anna in the funniest parts and really sells an Act II solo that puts a rare stretch of spotlight on Anna’s emotional scars and the consequences of neglect. The choice to end the show with a reprise of “Let it Go,” sung by Anna — in which she encourages her sister to be herself — is a powerful moment of compassion and reminds us that Frozen a story about the support and unconditional love between two sisters.